I love Italian food. Pizza and pasta are two things I could never give up eating. While pasta isn’t necessarily lower calorie, it is very filling, and you can do a lot of things with it. One of my favorite dishes is lasagna. 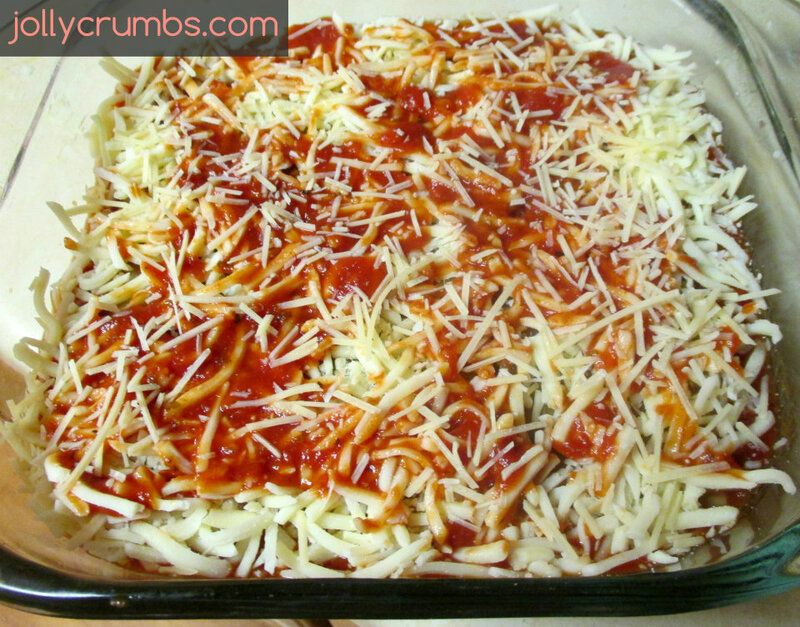 I love pasta, cheese, and sauce layered together in melty goodness. I’ve been making this easy cheese lasagna for a few years now, and it has not failed me yet. Don’t be afraid of making lasagna. I know all the layering can be tedious and may seem tricky. I have made a very simple version of lasagna that is packed with flavor. In this lasagna, I use oven ready noodles. So, these don’t require you to boil and cook them before making the lasagna. These noodles bake when the lasagna bakes. The sauce pretty much does all the work for you in this lasagna recipe. I love that! Of course you can use regular, cooked lasagna noodles in place of the oven ready ones. I just love the no fuss noodles. 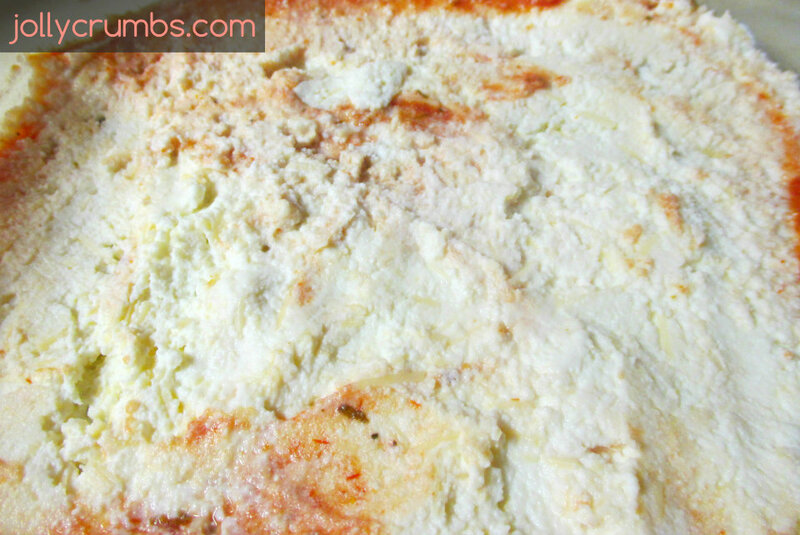 This may seem like a plain cheese lasagna, but it is wonderfully flavorful and also on the lower calorie side as far as lasagnas go. This lasagna is basic layering of ingredients. The first step is to mix together the ricotta and ½ cup parmesan cheese until it is well combined. Next, spread two cups of pasta sauce in the bottom of an ungreased 13×9 pan. Spread the sauce around so it covers bottom on the pan in a thin layer of sauce. This will help cook the noodles and keep them from burning. Top the sauce with four lasagna noodles. I use oven ready noodles, but you can use regular noodles as well. You will have to cook the noodles before making the lasagna if you aren’t going to use oven ready ones. Spread entire ricotta mixture over the noodles. It’s OK if some of the sauce comes through to this layer. Just try to evenly spread the ricotta mixture. Spread two cups of sauce over top of the ricotta mixture. Then add four noodles on top of the sauce. Repeat this again with two cups sauce and then four noodles. I halved this recipe for an 8×8 pan, so I broke my noodles in order to make them fit. Obviously you won’t need to do this for a 13×9 pan. Just don’t overlap the noodles, or they may not bake evenly. Sprinkle the mozzarella over top of the noodles. Add and spread the remaining sauce on top of the mozzarella. Then sprinkle the ¼ cup parmesan cheese on top. Cover and bake the lasagna for 30 minutes. Then uncover and bake another 30 minutes, or until it is hot and bubbly. Let it cool for 15 minutes before you cut into it. I couldn’t wait that long, so I cut into ours a little earlier than that! It will hold together much better if you do let it stand for 15 minutes. I have loved and made this lasagna for several years now. It’s such an easy lasagna to make, and it tastes wonderful. 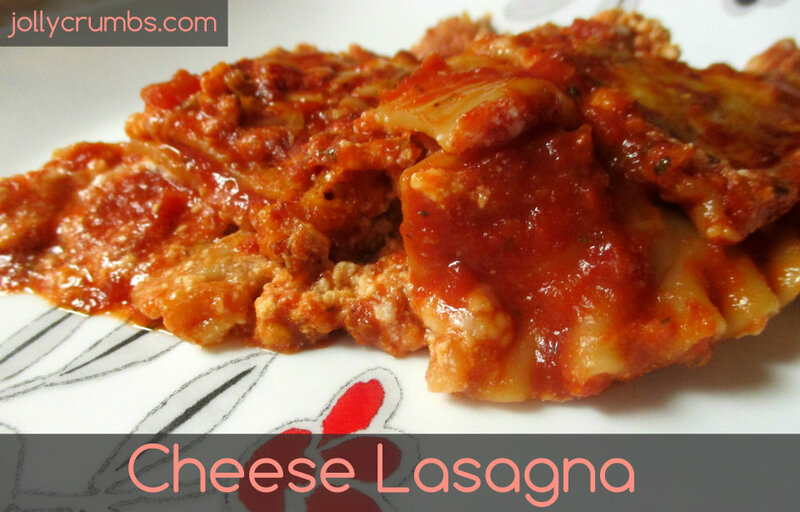 Using oven ready lasagna noodles really saves on time and prep with this recipe. It would work with boiled noodles too, I just prefer to make this as easy as possible. I’ve made the full version of this recipe and halved it, and both are equally delicious and impressive. This is my go-to lasagna, and it has never failed me. You can always add in browned meat or cooked chicken to make it meatier. Although, if you try the cheese version I don’t think you’ll miss the meat one bit. Mix ricotta and ½ cup parmesan cheese together until combined. 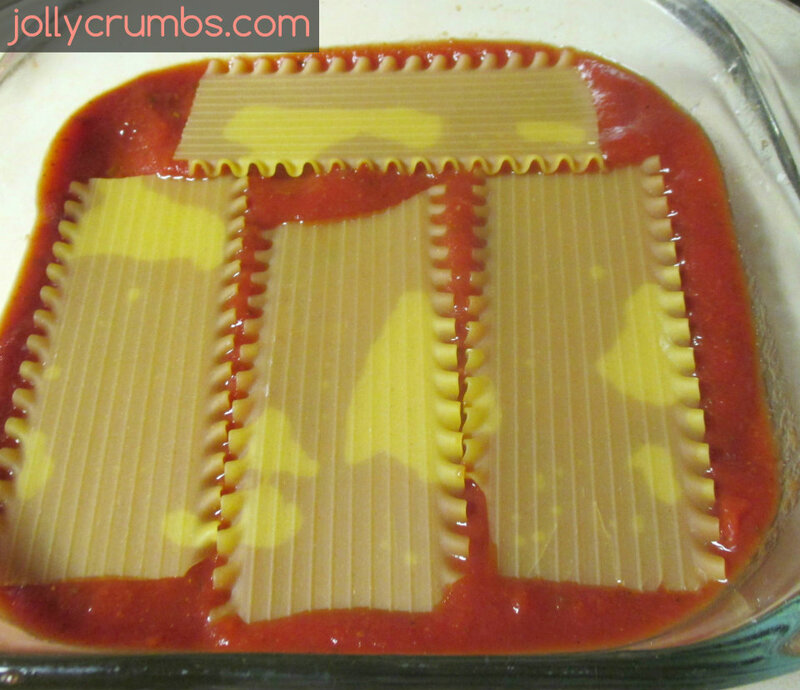 Spread 2 cups of pasta sauce in an ungreased 13×9 pan. Top with four noodles. Spread entire ricotta mixture over the noodles. Spread 2 cups sauce and then top with four noodles. Repeat again with 2 cups sauce and then 4 noodles. Sprinkle with the mozzarella. Spread the remaining sauce, and then sprinkle with the ¼ cup parmesan cheese. Cover and bake for 30 minutes. Uncover and bake for 30 more minutes, or until hot and bubbly. Let stand 15 minutes before cutting. I always use the oven ready noodles for this recipe, so I don’t have to boil the lasagna noodles and make more work for this recipe. You can choose whichever you prefer. I haven’t had a negative experience with the oven ready noodles, so I highly recommend them. Feel free to crack or cut the noodles into the size you need to fit your pan. I have halved the recipe for an 8×8 pan, and cracking the noodles worked perfectly to fit in the pan.